Remember what Bill and Hillary did when Mother Teresa spoke at the 1994 National Prayer Breakfast? While everyone cheered and gave her a standing ovation, the Clintons sat stony-faced. And Hillary today, despite many notes and prayers from Mother Teresa over the years, is more pro-abortion than ever. 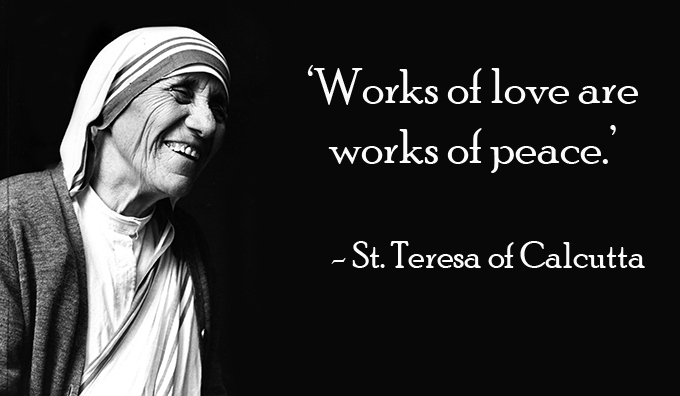 St. Teresa of Calcutta, pray for us and our poor country. And now listen to the words of our newest saint at the 1994 prayer breakfast. If you are no longer going to allow anonymous comments, please give a place where I can sign in via AIM. I was going to comment on the great Mother Teresa/Trump video, but now I can't. Sheesh! I was going to say that Trump seems to have surrounded himself with people that people of faith/staunch pro-lifers can be comfortable with. Because holiness lies in realism, I do not want to be overly optimistic, but I am still going to pray for Trump, vote for him, and hope for the very best for our country and the world. Why? Because ALL CATHOLICS have a responsibility to LIMIT EVIL when, where, and how they are able, and I sincerely feel that this is what a vote for Trump would do. Father Pavone always talked about the importance of limiting evil when voting, but he never quite laid the principle out quite as clearly as it was explained in this homily. https://www.youtube.com/watch?v=y3pTwgMm3Bc This priest says that limiting evil is a totally valid option for Catholics, if one's individual conscience allows it, and that even Popes have done so many times, in licit efforts to stave off what they perceived as more severe evils on the horizon if nothing is done. The priest even adds that the Vatican even entered into a concordat with Hitler in his time, and that this may not have been the best thing to do in hindsight, but that it still was not immoral. Is Donald worse than Hitler? Certainly not! And he is surely better than Hillary. All Catholics with qualms about voting for Trump (and all Catholics in general, IMO!) should hear this talk before they vote--or don't vote, whatever the case may be!